Always and Forever (in my heart) was designed when my father suddenly passed away (he was 81 and had a wonderful life - it was just unexpected.) To commemorate a life well lived, I designed this because I will always and forever love that man. I made a couple of different color ways so it can also be used to celebrate your love for a child or dear friend. Always & Forever in the patriotic color way is stitched on R&R Reproductions 30 count Busy Bee Blend using The Gentle Art Blue Jay, Cherry Wine, Flax, Midnight and Oatmeal with JABC pack 5964 and a sewn finish to create two small pillows. 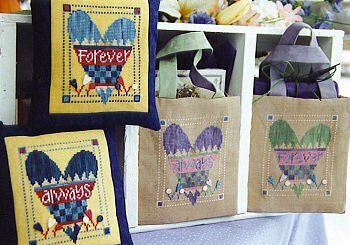 Always & Forever in the pastel color way is stitched on R&R Reproductions 28 count Lone Star Blend using The Gentle Art Blue Jay, Cameo Pink, Evergreen, Flax, Hyacinth and Victorian Pink and sewn into gift bags. Vintage chart with photo glued to cover.